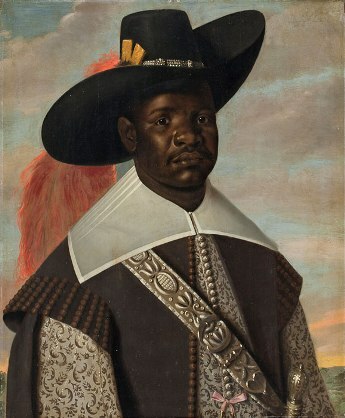 Dom Miguel de Castro is depicted in his role as ambassador from the Kongo province of Soyo to Holland’s colony of Dutch Brazil. De Castro’s 1642 mission on behalf of Soyo’s ruler, Daniel da Silva, was to strengthen ties with the Dutch in order to assert independence from Kongo and counter Portugal’s increasingly aggressive presence in Central Africa. On the occasion of his official visit, he wore the dress of a Dutch official in the French fashion: an open, studded black doublet; brocaded silk shirt with broad white collar; wide-brimmed felt hat trimmed with long plumes; and gold-hilted sword.